JUDITH HALL and HUGH WEBB formed a duo in 1992. Since then they have broadcast live for BBC Radio 3, and toured England and Scotland, playing in many festivals and music societies. 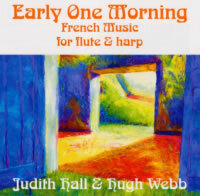 Described in Gramophone as "a truly magic flute", JUDITH HALL has had outstanding success with her many CDs, particularly Mozart's Flute Quartets, first choice in the BBC's "Building a Library", and for a time fifth best-selling classical CD in the UK. CDs of Vivaldi's Op.lO Flute Concertos and Mozart's Flute Concertos have been given top ratings in Penguin Guides and other reference books. Born and educated in Australia, Judith was involved in a different career when the French flautist Jean-Pierre Rampal heard her play and suggested she become a professional musician. Shortly after her London debut in the Park Lane Group's "Young Musicians" series, she was appointed Principal Flute in the Orchestra of the Royal Opera House, where she stayed for seven years while building up a solo career. She also played as guest principal with orchestras such as the Philharmonia, London Symphony, Royal Philharmonic and English Chamber Orchestra. As a soloist, she has played frequently in the major London venues and major British festivals such as Cheltenham International, Dartington, Musicfest Aberystwyth, Aldeburgh Proms, Taunton, Arundel, Brighton, Harrogate, Vale of Glamorgan, Swansea, Gower, Machynlleth and many others. Abroad, she has played in Turin, Montepulciano, Como, Middelburg, Halle, Adelaide and Sydney festivals. She has toured France, Belgium, Holland, Germany, Italy, Scandinavia, Spain, Portugal, Greece, India, Australia, and many parts of South East Asia. She has performed in British festivals with members of the Skampa and Schidlof Quartets, and also plays with the guitarist Craig Ogdon. She is a professor at Birmingham Conservatoire. Judith is heard frequently on BBC Radio 3, having recorded a great amount of the flute repertoire, as well as solos with the BBC orchestras. She has also been featured artist on" Brian Kay's Sunday Morning", "Kaleidoscope". "Tuning Up" and "Woman's Hour". HUGH WEBB is joint principal harp of the Philharmonia Orchestra. He was born in London and studied with Renata Scheffel-Stein, Sioned Williams and Susan Drake. In 1989 he performed in the Park Lane "Young Artists Platform" at the Purcell Room, where he premiered Javier Alvarez's According to Differences for harp and tape, which he has since recorded for BBC Radio 3 and Saydisc Records. Recent CD recordings include Bax's Concerto for Flute. Oboe & Harp with the Academy of St. Martin's Chamber Ensemble (Chandos), Villa-Lobos' Quartet (Clarinet Classics), Bax's Fantasy Sonata (Koch) and the complete Spohr Violin & Harp Sonatas (Naxos). He has worked extensively in the contemporary music field and has premiered many works in the UK and abroad, with groups such as Lontano, Music Projects London, Avanti, Endymion Ensemble, Critical Band, London Sinfonietta, Matrix, and the Composers' Ensemble. He has given recitals at the Huddersfield Festival, the Glasgow Computer Music Festival, the Almeida Festival and many universities. Composers who have written solo works for Hugh include Javier Alvarez, lan Dearden, Paul Archbold, and Robert Keeley, all with support from the Arts Council. Recent Radio 3 solo broadcasts have included Gliere's lrnpromptu, Cage's In a Landscape, and Debussy's Danse Sacree et Danse Profane with the BBC Scottish Symphony Orchestra. He has appeared as a soloist at the Kings Lynn and Oxford festivals and undertaken a three-week solo tour, which included the Isle of Man, Scotland and the North of England. He has also taken part in two chamber music Proms. Hugh has composed a show for children based on Hans Christian Anderson's The Snow Queen. He has given many masterclasses throughout Europe and has lectured at the Paris Conservatoire, the Sweelinck Conservatorium (Amsterdam) and Telynor Morgannwg (Wales). He is a professor at the Royal Academy of Music and the Guildhall School of Music. Few could fail to be inspired by this dynamic duo's rendering of the French Repertoire.
" ... filigree or glitter, arpeggios and runs, virtuosity or sheer feeling, Webb is master of them all"